Dalfina wearing the EZ Dress pattern. 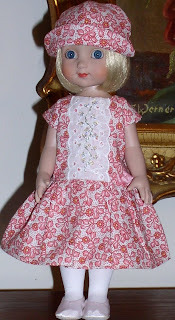 Below is Ann Estelle wearing same dress Dalfina is wearing above using the EZ Dress pattern. The EZ Dress E-Pattern for Bleuette and Ann Estelle is not designed to be any year or design of the LSDS magazines for Bleuette. 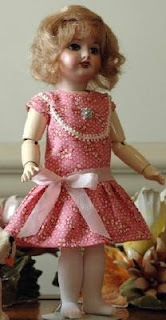 It is just an easy to sew doll dress for that size doll. 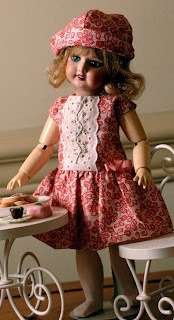 A beginner could easily make up this outfit and feel as though they can go on to other, more difficult sewing projects. Have fun with this free E-Pattern. As with all my free E-Patterns, email me at pamamom@gmail.com if you would like this pattern.